1. Adaptation to the new version of the game ( 1.23 ). 5. Fixed glass on the headlights. 10. Fixed a collision . This update fix the chasis 4x2? Nelson2230 wrote: This update fix the chasis 4x2? Ight I've sent you some pm to receive the update. Thanks for fixing it! 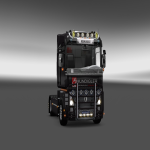 You can buy Renault T For ATS ,For ETS-2 and For ATS+ETS-2 merci de votre r?ponse. Hi, got the update yesterday and thanks so much. I have a small question. Do you know there is a bug when you try and sellect interior? The screen starts to "flicker" and you cannot sellect any addons inside the interior. I forgot, it seems like there are more options in the old version 4.3 than the new, how come? Ipgaxx wrote: Hi, got the update yesterday and thanks so much. I have a small question. It?s Version 1.24 ( SCS) it changes the camera setup. 5.1 is for Version 1.23! Evelyn_Sophie wrote: It?s Version 1.24 ( SCS) it changes the camera setup. 5.1 is for Version 1.23! I guess i have to wait for next update? There is a fix for 1.24! Why do we have to go to other pages than RTA to find fixes and updates? Why cant you guys just have one site like we use to have, where we could login and download the updates we needed? If i had known this, then i would never have bought 2 trucks and trailer back then. Ipgaxx wrote: Why do we have to go to other pages than RTA to find fixes and updates? Sorry to hear that! The Renault T has not the top priority... sadly! Evelyn_Sophie wrote: Sorry to hear that! The Renault T has not the top priority... sadly! Renault T will be updated in the near future.